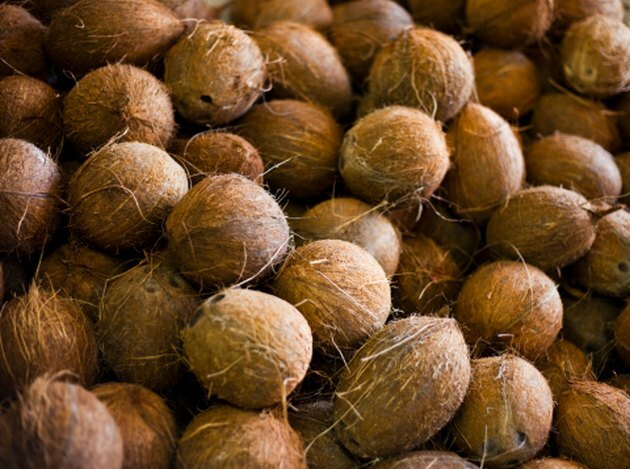 A rich by-product of the fruit of the coconut tree, virgin coconut oil may offer soothing relief for inflamed skin. Coconut oil is a natural antibacterial that has long been advocated by herbalists for relief of eczema, acne, dermatitis and allergic skin reactions. As an absorbent and quick-drying oil, coconut oil may be an effective after-cleansing skin-soothing treatment and is a popular choice as a carrier oil for aromatherapy massages. Fill a sink or basin with steamy hot water. Apply cleansing cream or cleansing oil, such as olive oil or castor oil, to the inflamed skin. Cleanse the inflamed area gently and thoroughly. Rub the oil into your skin using circular motions and only the pressure from your fingertips. Dip a soft, clean cloth into the hot water. Rinse the cleansed area thoroughly with the wet cloth. Pour a small puddle of coconut oil into the palm of your hand. Press your hands together and rub to warm up the oil. Apply the warmed coconut oil to the inflamed area. Rub gently with your fingertips until the area is saturated and completely covered. Allow the oil to seep into the skin before covering the skin with clothing or dressing. If the area of inflamed skin is large, consider warming the oil gently in a pot of hot water, then spreading the warm oil onto a soft cloth to apply. Always contact a health care professional if your skin condition is painful, bleeding or oozing.